®Screen Printing (SP): Price includes a 1 color, 1 side imprint. 4 colors available per side. Add $.12 per lighter for each additional imprint color, per location. 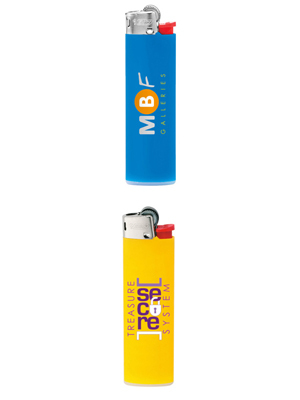 Warning label will be affixed to Side 2 of the lighter after imprinting. See diagrams for imprint area, location and number of colors. J25 and J23: U.S. Patent Nos. 5,735,294; 5,520,197; 5,993,198; 5,483,978 and other issued and pending patents.